With over 25 years’ experience in teaching students in the heavy vehicle industry, Affordable Truck School is one of the most popular driving schools chosen by industry professionals looking to upgrade to a multi combination or b double truck licence in Brisbane and the Gold Coast. With an excellent first time MC licence pass rate in QLD, you can trust Affordable Truck School to provide you with training and skills that will last a lifetime. By providing MC truck lessons to Brisbane’s Southside and Northside, we offer highly professional, enjoyable and comprehensive one-on-one training to all of our students to ensure they uphold all safety standards on the road. Our trainers and assessors are friendly, experienced and highly qualified, and offer a flexible range of training times across 7 days a week for all our MC and b-double truck lessons, as well as MR licence training. Unlike the licence requirements for lower class truck licences, the multi combination license training is a competency-based course, meaning we train and assess you in the TLIC4006 – Drive MC vehicle course, as we are a QLD approved MC licence RTO (Registered Training Organisation). When you are deemed ready, we issue you a Statement of Attainment that you can take to TMR to upgrade your licence. What MC Licence Should I Choose? MC Auto and MC Synchro are restricted truck licences which means you may only drive these types of trucks. It depends on the type of truck licence you previously held before upgrading, but you may be unable to drive trucks that require a MC Unrestricted licence. The MC Unrestricted is conducted using crash box transmission with double clutching. This option is the open option which means you are licenced to drive all three transmission types. 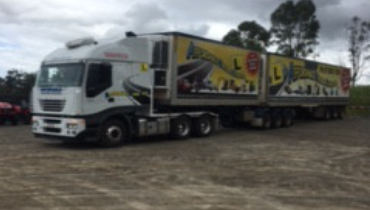 To upgrade your licence to a multi combination / b double licence with our truck driving schools (class MC), you must have held either a HR – Heavy Rigid or HC – Heavy Combination truck licence for at least 12 months. You also need to be able to read and write basic English and complete a language literacy and numeracy (LLN) test. 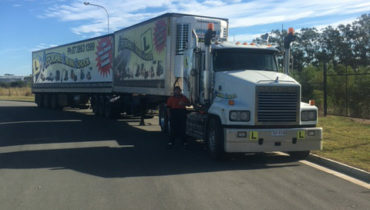 What your MC – Multi Combination Truck Training and Licence allows you to drive. The Queensland Department of Main Roads and Transport laws allow you to drive. A B-Double (prime mover towing 2 semitrailers, with 1 semitrailer supported at the front and connected to the other semitrailer. A road train (motor vehicle, other than a B-double, towing 2 or more trailers). A MC licence can open up many job opportunities in the transport and logistics field as well as many other fields of work around QLD. MC licence is useful to have for delivery drivers, interstate and local distribution drivers to name a few, allowing for major freight across Brisbane, the Gold Coast and state-wide. MC is also the highest class of truck licence you can get!! This package is ideal for those who hold a HC or HR unrestricted licence with extensive experience driving with trailers and for those that are currently working in the transport industry. Also suitable for those only wanting the MC restricted licence. This package is suitable for students with limited truck experience and those that hold a restricted HR or HC licence but may be thinking of upgrading to an unrestricted/open licence. $150 per hour – if you require any further practical training or.refresher lessons (* there are minimum booking times required). 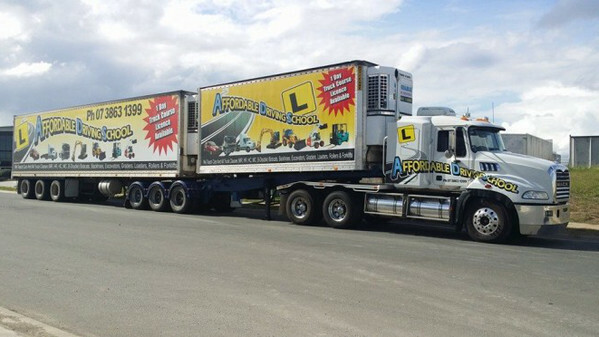 Whether you want lessons on the Southside, Northside or even the Gold Coast, Affordable Truck School can assist in helping you train for and attain your b-double licence. Get in touch to book your lessons today.